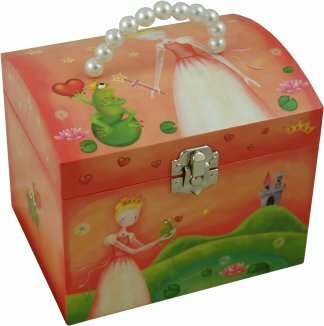 A beautiful music box with a colourful Princess & Frog design. 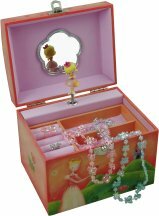 Open the jewellery case to play the delightful melody & see the little princess turn in the mirror. The domed shape lid has a faux pearl carry handle with chrome clasp and there's even a lift out tray inside with ring holders & separate compartments. Wooden board construction with shiny printed laminated design. Mirror on inside lid, lift out tray. Clockwork wound from the back, the princess figure revolves as music plays.